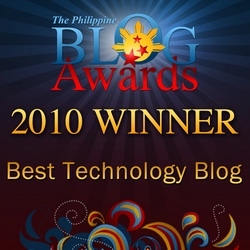 My Silly Point of View is nominated for Best Technology Blog! The event will be held on 12th of December 2010 at Carlos P. Romulo Auditorium, RCBC Plaza. Hopefully, I’ll be able to win the award but nevertheless, the ultimate goal is to be with the best Filipino bloggers in the country. whoa!? think you can do web stuff huh!